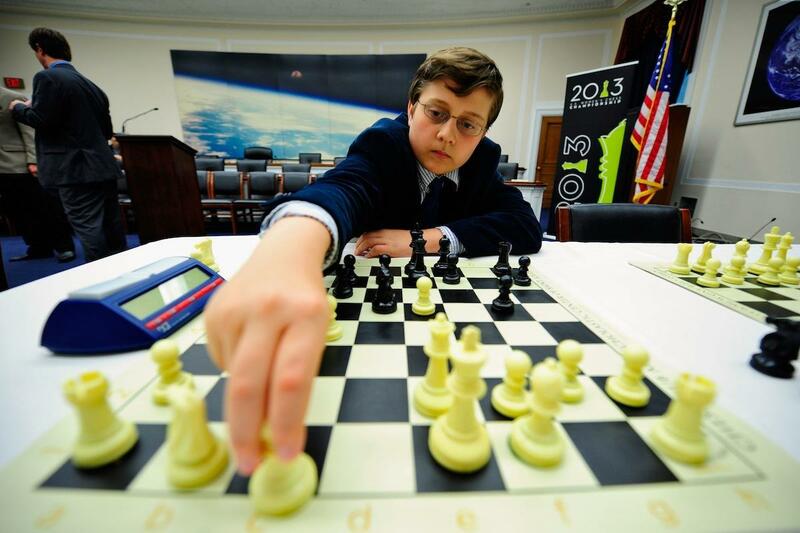 Sam Sevian should be earning a spot as one of your instantly recallable names: The 12 year old from Corning, N.Y., is the reigning world champion for his age and the youngest ever to play in the U.S. Championship, which he did this past summer here in St. Louis. Sam Sevian has been a chess headliner for half his life. He has been under the chess microscope for years, having already served as the fastest American to both Expert and National Master status, and I believe it is safe to assume he has become a fixture in chess’ future. Go ahead and commit that brain wrinkle. Sevian’s impact is now recognized globally, as FIDE just awarded him the title of International Master. He had completed all the necessary performance norms for the title more than a year ago, but was waiting for his rating to reach the necessary threshold of 2400. The “delay” was the prodigy-version of “hitting a plateau,” though he finally surpassed the mark in Budapest, Hungary, last month. As it has been, American chess talents have often skyrocketed to the upper stratospheres of the game only to become lost in space, floating directionless in a search for tiny hoops and limited opportunity. The struggle, of course, was not always a lack of ability, but simply a lack of guidance: Who do we have to lead us to those tallest peaks, when the road itself has been traveled by so few? Back in 2012, the Chess Club and Scholastic Center of St. Louis addressed this problem by hooking up with the greatest living Sherpa we have today: Garry Kasparov, the13th World Chess Champion. The Chess Club established a five-year educational partnership with the Kasparov Chess Foundation, creating a group of students called the Young Stars-Team USA, who were to be personally coached by the world champ twice a year along with secondary Kasparov Chess Foundation-appointed coaching. Not two years into the program, participant milestones such as Sevian’s IM title are showing signs of early blossom. This may be low-hanging fruit, some might say: Sevian has been making chess headlines for more than half his young life. But the program was designed not only to identify America’s extraordinarily talented players, but also to maximize their potential. Every next-level of chess becomes exponentially more difficult to achieve than the last, and a trajectory like Sevian’s would be a terrible thing to see sputter. The ultimate destinations in chess are obvious, but the roads to get there are foggy. Today, the Young Stars have Kasparov’s map, allowing them to keep the prodigy pedal to the metal with the confidence that they are headed in the right direction. On this level, there is not much room for error, for missteps, and definitely no time to look into the rearview mirror: Sevian has already been surpassed as the youngest-ever National Master, beat out this year by Wisconsin 9-year-old Awonder Liang – another Young Stars-Team USA participant. Other participants include Utah’s 15-year-old IM Kayden Troff who, like Sevian, has also became a world champion for his age bracket since joining the Young Stars. Troff has collected two norms toward the Grandmaster title, and he participated alongside Sevian at the 2013 U.S. Championship. With young stars such as these leading the way, the future of American chess looks a little bit brighter. At the age of seven, it’s safe to say that most kids want to be just like their parents – walk like them, act like them, work like them. For Diamond Shakoor, that meant being intrigued by her dad Abdul, who at the time was teaching older kids on how to play chess. “I asked him one day if I could play and he was like ‘Sure, if you stop getting in trouble in school.’ And so that’s how the journey started," she says. Teach her he did, and now, after playing in nearly 250 tournaments, she’s unstoppable.